Green Chair Gallery offers art online, giving art-lovers the opportunity to enjoy work from an array of global artists and sculptors. 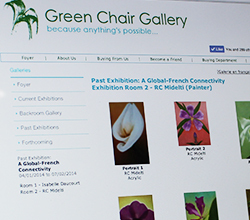 Green Chair wanted to use the opportunity presented by the Internet to develop an online only art gallery, showcasing the work of global artists. There was a keen desire to create a gallery ambience for the website and be distinct from retail and commerce focused websites. Cyberkix worked closely with Green Chair Gallery to develop a design that embodied a gallery ambience, structuring the customer journey around gallery and exhibition practices. Cyberkix provided support in helping Green Chair understand their customer base and track customer journeys, training staff to be able to further develop and enhance the site.